Each week, over 26,000 Cardiffians tune into Radio Cardiff, the capital city’s only community radio station. It’s programmes go out 24 hours a day, and a schedule for a typical day lists more than 100 different features. Aside from being the only community radio station in the City, we are actually the only terrestrial station of any kind that broadcasts exclusively to Cardiff and its richly multi-cultural population. We are proud to give a voice to the diverse communities living in what is both one of the oldest established multi-cultural areas in the UK, and the youngest capital city in Europe. Radio Cardiff has over 120 volunteers from across the communities that make the city their home. But there is more to Radio Cardiff than just broadcasting. The station has become very much part of the community. We first went on air in October 2007, and we are an established part of the City’s life and each week we connect our audience to a huge spectrum of events, opportunities and recreational activities in the Welsh Capital. 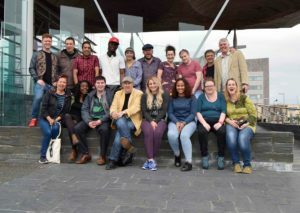 Radio Cardiff Volunteers 2017. © Radio Cardiff / VCS (Cymru) Limited. The station’s day-to-day operations are delegated to a volunteer Management Committee led by our Head of Radio (Donna Zammit), and made up of programme makers, broadcasters and local people. It is directly responsible to the Trustee Board of VCS Cymru and is regulated by Ofcom. VCS Radio Cardiff is an active member of the Community Media Association (CMA). Radio Cardiff is the city’s award-winning local radio station, showcasing the cultural diversity of Europe’s youngest capital city, on FM, online and on mobile. The community radio broadcast licence for Radio Cardiff is owned and operated by VCS Cymru.